The Cincinnati Reds have no hope of a playoff appearance, and have not since about two weeks into the season, but ever since Jim Riggleman took the managerial reins away from Bryan Price, the Reds have been respectable, playing right around .500 baseball. The play has many Reds fans hoping a return to contention will come sooner rather than later. The lack of huge movement at the deadline for the club (their biggest move was trading Adam Duvall, a piece who likely had a limited future in Cincinnati) may suggest that the front office sees contention on the horizon as well. The emergence of a few players has helped brighten the outlook on the club’s future, and three of them are the focus of this stats preview. Scooter’s Sustainability: If this is the real Scooter, then the Reds have a good problem on their hands, with more talented infielders in their system than spots on the field. 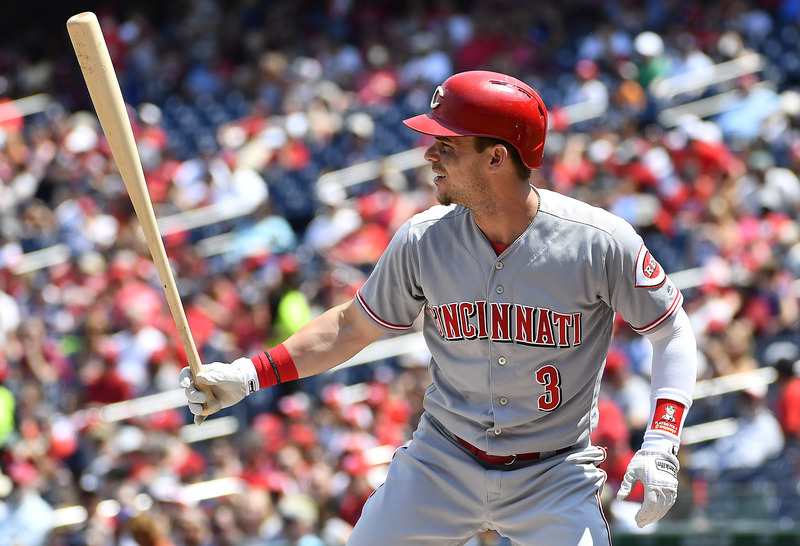 Gennett has doubled down on his strong 2017 with an even stronger 2018, posting a .310/.361/.496 line, good for a .304 TAv and 4.5 WARP. He continues to post a high BABIP (.356), but his line drive rate of 24.8% is among the top 30 in the league and suggests any BABIP regression will not hit him too hard. He has cut his strikeout rate to below 20% as well, further supporting the notion that his offensive talent is legit. BP’s projection system has not quite bought in, projecting him for a mediocre .261 TAv and 0.4 WARP the rest of the season, but as his sample size of above average output grows, it is becoming harder to ignore to possibility that he may be this good. Houdini Hughes? Another former Brewer having success with the Reds, Jared Hughes has been an integral part of the Reds bullpen this year. His 1.44 ERA is not supported by FIP (3.03) or DRA (4.64), which means his phenomenal results may not have staying power. He has never been a huge strikeout guy, sporting a career K/9 of 5.92, but his 2018 rate is 6.87. His ground ball rate, though, is among the best relievers at 66%, good for fourth in 2018. That number is fueled by his 92 mph sinker, which he throws 75% of the time. The pitch is also propping up his 0.32 HR/9, which is 16th best among qualified relievers. While his batted ball profile lives on the extremes, he has had sustained success with it, throwing 55 or more innings of 3.03 ERA or better in six of the last seven seasons. So while his 1.44 ERA may not last through the end of the season, his heavy groundball profile is the kind of pitcher that FIP and DRA sometimes underrate. Winker’s Awakening: Winker will not play in this series (he is out for the year with a shoulder injury), but to get a full picture of the state of the Reds’ turnaround, he should be discussed. There are also parallels to a certain promising, young Mets outfielder whose 2017 season ended due to a shoulder injury, but I hope the comparisons stop there, because I would not wish Michael Conforto’s struggles on even a fellow NL foe. What Winker was able to do this year before the injury was post a .299/.405/.431 line and 3.1 WARP in 334 plate appearances. His BABIP was a little high (.336), but he had also increased his line drive percentage by almost eight percentage points (16.5% in 2017 to 24% in 2018). He also decreased his ground ball percentage by over 10 percentage points, which did not translate directly into a home run explosion (just seven in 2018), but it was the right idea in this run environment, especially in Great American Ballpark. Gennett walked more than he struck out, something only seven qualified hitters have done this year, which all means his breakout was probably for real. Now, Reds fans, like Mets fans last year, will wait to see how he responds to his shoulder injury. Hopefully he has a smoother transition back to games than Conforto. The Good: The Reds are the only team with three position players with three or more WARP. The Bad: Despite hitting at Great American Ballpark, the Reds are just 20th (117) in team home runs. The Mets are 23rd with 110. The Ugly: Cincinnati pitchers have given up the most home runs with 161. The Mets have given up the eighth most with 134. This is sort of cheating, because Matt Harvey is no longer a Met, but I was interested to see if anything had changed with this version of Harvey. His velocity readings are not significantly different – he has sat 94-95 mph with the four-seamer with Cincinnati. His 4.79 ERA is certainly lower than it was in New York (7.00 before he was traded), but his ERA indicators tell a different story. His FIP is a little better with Cincinnati (4.78 to 5.65), but his DRA of 4.81 is worse than it was with the Mets (3.99). So has Harvey really started to return to form in the lower profile environment of Cincinnati? Unless his peripherals and actual production are lying to us, probably not.